A FEW DAYS OF FEASTING: Ninety members of Native-American tribe, the Wampanoag, were invited by emigrants for a week long feast recently held in October. .–– The trek from their village, to what has been renamed "Plymouth," took two days by foot. HE HAD THEM AT 'HELLO': Tribesman Squanto first introduced himself to Mayflower commuters in March of 1621. .–– With his English skills, from years of forced servitude in Europe and on British ships, he helped the new settlers adapt agriculture techniques in the New World. FIRST WINTER WAS HARSH: After experiencing their first winter that took away half of their tribe. 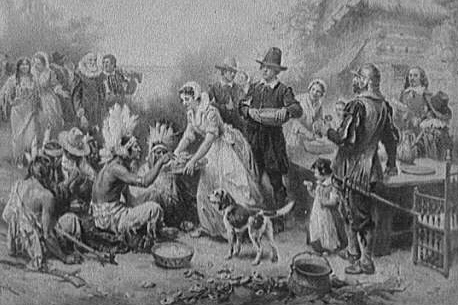 .–– Pilgrim Governor William Bradford regards this first Harvest Feast is a chance to give thanks for the "bountiful harvest" that allows the Plymouth tribe to save food for this upcoming winter. .–– The other tribal chief, Grand Sachem Massasoit, did not come empty handed as his men hunted deer and brought venison to the feast. Also attending were Myles Standish and William Brewster.